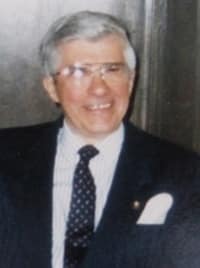 John Michael Lacusta - Edmonton's Burial & Cremation Professionals | Trinity Funeral Home Ltd.
February 25, 1929 – January 22, 2018. John passed away peacefully after a stroke, eight years ago, left him in the care of a wonderful staff at Touchmark in Edmonton. John leaves us to join his loving wife, Joyce, who passed away June 15, 2016. John was a devoted father to Michael (Younes), Carolyn (Jim) and cherished grandfather to Ryan and Brett. A genuine, kind man who served others in his role as head waiter, catering manager with CN hotels; director of government services at Government House, Alberta; Kiwanis Club and church member; John will be remembered for his warm smile, contagious laughter and love of spending time with family and friends, especially when this meant re-uniting in the maritimes. A family celebration on Prince Edward Island will see both John and Joyce return to their beloved island and the “green, green grass of home”. In lieu of flowers, donations to the Heart and Stroke Foundation of Canada (www.heartandstroke.ca) are appreciated. On behalf of all of the Redmond’s, we are very sorry to hear this news. Dad and Anne were away from all of January and February and received your voice mail when they got home this week. If you have an email, phone and address you can send me, I know they would like to contact you. Our thoughts and prayers are with you all. Thinking of you Michael and very sorry for your loss. Am so sad to hear of your loss. Prayers and thoughts are with you. I feel your grief as well. Our sincerest condolences to the family of John and Joyce. We remember them both as kind and wonderful people who were great friends to my mom and dad, George and Hilda Williams. So sorry to hear the sad news. Please accept my sincere sympathy and convey the same to all your loved ones.